The Surfer’s Path Hang 10 consists of a 10 mile run/walk. The event starts in the heart of Capitola Village and travels through scenic Pleasure Point and East Cliff Drive, offering sweeping views of the Monterey Bay. Participants continue on East Cliff until they reach the turn around through Arana Gulch Park, overlooking the Santa Cruz Harbor. Following the turn around, participants travel back, passing beaches and famous surf breaks as they return to the finish line located in the heart of Capitola Village. The race begins promptly at 8:00 am. 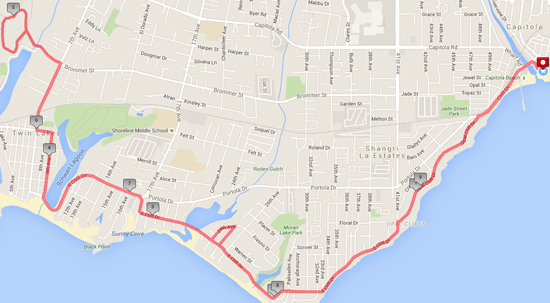 The course is managed at a 15 minute per mile pace. If you are passed by the event crew, you will be asked to move onto the sidewalk. Once you are on the sidewalk, you must follow all traffic laws deemed by the County of Santa Cruz and City of Capitola. There are four course water stations located at approximately miles 1.8, 3.8, 6.2 and 8.1. Restrooms are available at the start, miles 1.2, 1.8, 3.8, 6.2, 8.1, 8.7 and at the finish line. Post race activities take place in Capitola Village near the beach. Participants pick up their surf inspired event shirts, receive post race food, and enjoy the finish celebration! Each finisher will receive a commemorative finisher’s medal at the finish line. Awards will be provided to the top three over-all male and female finishers.